On the second of April, the world’s largest crypto-exchange Binance organized its meetup in St. Petersburg that followed the one held in Moscow last year. The event was intended to invigorate a crypto-community that was tired of the down trend, and to talk about new tools brought by Binance to the market. The most notable of them are the Launchpad platform, which brought renewed hope to the crypto investors and startups, and the decentralized Binance DEX exchange that became a kind of response to the curses of Vitalik Buterin, who loudly wished centralized crypto exchanges to burn in the depths of hell. Binance’s meetup in St. Petersburg turned out to be truly amazing. First of all, right before the event, Bitcoin rose sharply by $1,000 as if confirming the onset of the ‘time for new hopes’ at the crypto industry. Naturally, this did not happen by the magic wand of the great CZ, just a coincidence. However, it did add to the general mood of the audience. Secondly, that April day in St. Petersburg turned out to be so sunny and warm that in the large hall where the Binance meetup took place, they had to open the windows. What a generous gift from St. Petersburg with its less than 70 sunny days a year! The room, by the way, was expectedly overcrowded. Thirdly, meetup in St. Petersburg was the first event where BNB tokens were presented not only as a Binance’s domestic currency, an investment instrument and a liquid digital asset, but also a means of payment for everyday life. 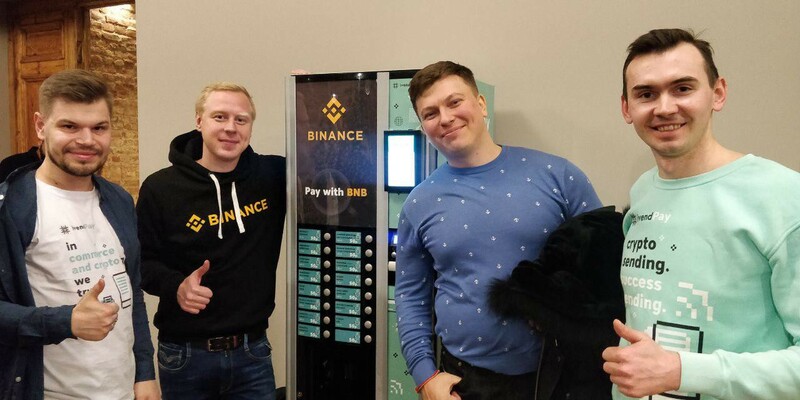 Numerous participants of the meetup, as well as its organizers, headed by Gleb Kosterev, Binance representative in Russia and the CIS, met a coffee vending machine of the ivendPay payment service at the entrance. Buying coffee and other drinks in it for BNB tokens appeared to be as easy as for fiat money. This impressed the participants of the meetup so much that they arranged coffee time spending their BNB tokens and really cheered up even more than from the dizzying prospects of Launchpad. Launchpad platform now really works wonders, especially noticeable in the bear market and against the background of a sharp cooling of investors to the ICO. Iт case you have not heard, Launchpad launched a whole new crypto industry trend, the ancestor of which is, actually, Binance and its ingenious founder Changpeng Zhao, better known to the crypto community as CZ. The idea of ​​CZ was simple, yet ingenious: once investors completely lost confidence in startups conducting ICO, it means you need someone reputable who would separate really promising projects from scam. Binance exchange acts simultaneously as an expert, and a guarantor, and a platform for the initial offering of startups’ tokens. On Launchpad, only those startups that have passed Binance scoring are allowed. The abbreviation ICO, which compromised itself completely, was replaced by IEO (Initial Exchange Offerings). This is a new way to attract funding: the cryptocurrency exchange deals with the project selection, the arrangement of token sale and the sale itself. There are few such startups, and they are really worth investing in them. Launchpad created quite a stir. After the platform relaunch, the first project to appear on it was BitTorrent, whose coins showed a 4.3X increase during initial listing and 6.4X so far. Investors were inspired by the good old ‘wind of the Big X’, which has not been blowing since 2017. Well, one could attribute the success of the first IEO to BitTorrent itself as it is the world’s most popular file sharing project bought by TRON. BitTorrent’s own audience exceeds 10 million users, and probably all Internet users have heard about it. However, Binance Launchpad welcomed two more startups shortly and those could not boast such user base. Nevertheless, they also showed a fantastic result: the tokens of the Fetch Ai and Celer Network projects grew 4 times during the listing. Even though only one in ten investors managed to bid, actually. That is, at the Binance’s platform, the number of people willing to invest their cryptocurrencies in startups is one order of magnitude greater than the offer. The Binance BNB token itself against that background headed to the Moon growing by 278%. And the fact that these tokens can now be used in the ivendPay payment system only added excitement around the coin. The ivendPay payment system provides a service for accepting payments in vending trade, retail and e-commerce by means of two client devices: a plug-and-play module for vending machines and an mPOS terminal for retail and e-commerce. Payments are accepted in fiat, digital currencies and cryptocurrencies. As soon as a new digital coin is added to the service’s payment gateway, it is automatically acceptable in ivendPay client devices. The BNB token was added to the payment service shortly before the meetup so it was really the first time the coin was accepted to buy a cup of coffee at the coffee vending machine. As a result, one of CZ followers noted that coffee appeared to be the key to crypto mass adoption. Eventually, all participants of the Binance meetup in St. Petersburg headed to drink coffee for the cryptocurrency found in their wallets as the payment system accepts 12 cryptocurrencies and continues to expand the list. And thousands of followers who read the tweets of their crypto idols, expressed a desire to immediately join them in St. Petersburg. To sum up, Binance and its Launchpad platform seem to have a great future. The idea has already been copied by 13 major exchanges, including Bitmax, Huobi, Bittrex, OKEx, EXMO, Kucoin, etc. Each of them has an impressive and solid community, which is keenly interested in revitalizing crypto-industry and is ready to invest digital assets in startups vouched by trading platforms. Everything that is happening has already launched a powerful wave of optimism on the crypto market that is recovering after ‘ICO collapse’. In six months or a year, hardly anyone will remember that the new rise in the crypto market began thanks to the Binance Launchpad and a cup of coffee purchased through ivendPay at the meetup in St. Petersburg.